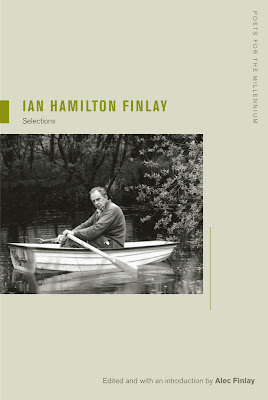 Ian Hamilton Finlay: Selections, edited with an introduction by Alec Finlay (UC Press, 2012, 312 pp., paperback, $24.95). Like many of his predecessors Finlay's road to the title was one of early poverty, dismissal of his work, and a life of struggle leading to late recognition. Born in the Bahamas, Finlay spent a lot of his early life on boats, one of which smuggled rum into Prohibition ports in the USA. But after the family's orchards in Florida failed due to frost he was shipped off to school in Scotland. As a teen on Clydeside Finlay heard German bombers voiding down explosives and incendiary bombs on the dockland and surrounding areas. Cowering under the table he saw the flash of bombs and waited for the explosions. It seems he never recovered from this traumatic experience. 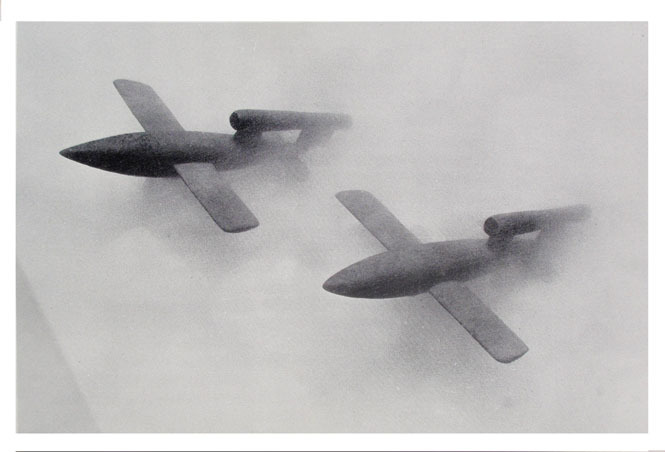 Charts were published by the War Office showing the silhouettes of airplanes so you would know friend from foe. In 1941 Rudolf Hess crash-landed his Messerschmitt, bailing out over Scotland, hoping to broker a peace deal, but was locked up as a war criminal. Finlay enlisted in the British Army in 1942 as a non-combatant. Traveling through Holland he was astounded to see rows of German tanks lined up in front of intact neo-Classical buildings. Another deep impression was made. After the war he became a shepherd on the remote Orkney islands. His early adult life, seemingly pastoral, was actually turbulent: his girlfriends were as much nurse as muse, and he was finally diagnosed as agoraphobic and treated with LSD-25. His illness put severe constraints on him and he was only happy at home. But he had a vast correspondence among the literary avant garde, including Robert Creeley, Lorine Niedecker and Jerry Rothenberg in America, as well as publishers Jonathan Williams (of Jargon Press) and Gael Turnbull of Migrant. He allied himself with Edwin Morgan and younger Scots poets and their magazine Poor. Old. Tired. Horse. was derided in the media as Poor. Young. Trite. Verse. 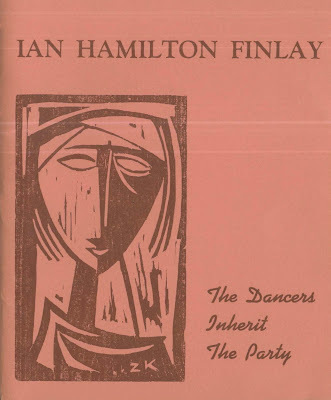 The Dancers inherit the Party, (true first edition), Ventura, Ca. : Migrant Press, 1960. Mimeographed with cover woodcut by Zeljko Kujundzic. 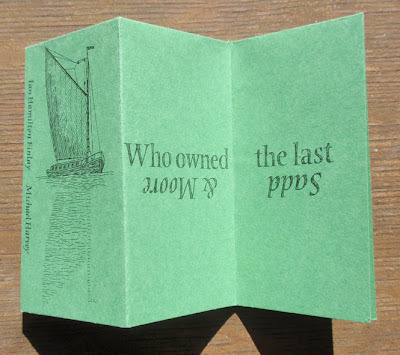 In 1963, Finlay began to write concrete poems which are best seen in the original context: whether as an artwork or a small press book with clever typography. There is an attempt to illustrate one or two in the present book (in 2D and monochrome) which is not very successful, but the introduction, by Finlay's son Alec, is a resumé of the poet's career and quotes extensively from his correspondence to illuminate his ideas about poetics, morality, and his various struggles. 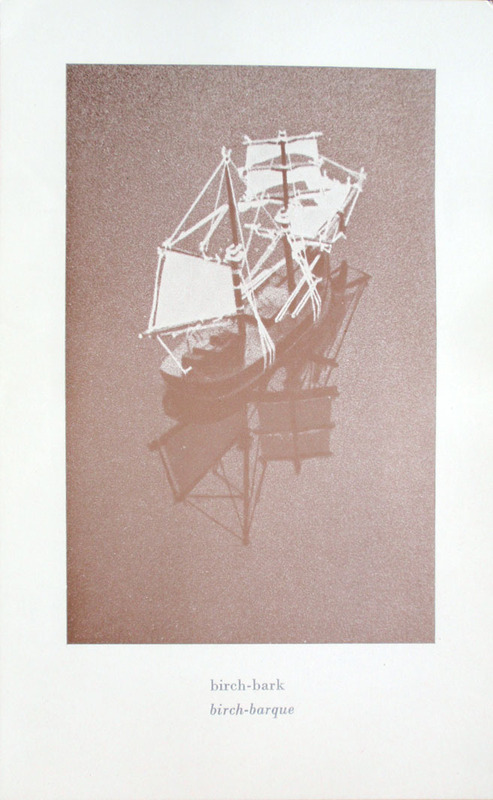 Finlay first discovered concrete poetry through Eugen Gomringer, then published the Brasilian De Campos brothers in his magazine, and even compiled an anthology of concrete poetry for Rothenberg (which has remained unpublished), including Kandinsky and Klee to show that there was a long tradition of using language abstractly. Finlay was excited by concrete poetry which existed objectively: he was "through with poems which are about, and instead wanted poems which just are" (from a letter to Gael Turnbull). He also began to envision his concrete poems sandblasted on glass, set in a landscape. By 1967 he had contracted the local gravestone cutter to make an inscribed stone for him. In 1968 he collaborated with Hansjörg Mayer who would publish a series of influential books, most notably the work of Dieter Roth, the icelandic artist. Others (Ferdinand Kriwet in Germany, Robert Lax in the USA) were working on similar paths and in Britain there was Dom Sylvester Houédard who created kinetic outdoor sculptures out of words (Finlay dismissed him as "anti-culture" and "nonsense"). I have to add that my own discovery of Houédard's wonderful work in the 60s made me rethink the possibilities of poetry as art. (A Benedictine monk, Houédard was also the literary editor of the Jerusalem Bible). After his second marriage, Finlay's in-laws gave him a small plot of land with a cottage on their estate and that is where he became the great artist, gradually turning the wind-chapped border landscape into Little Sparta, his own one-man nation standing against the might of empire. Other than the allusion to Ancient Greek wars, it should be borne in mind that nearby Edinburgh was called "the New Athens" in the time of Sir Walter Scott. 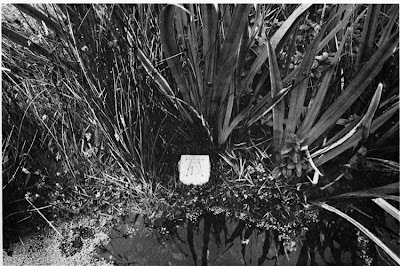 His wife Sue planted the flowers; Ian dreamed up the site-specific texts. Thus his concrete poems were soon literally that, carved in stone or wood. Finlay carried his childhood delight in toy boats and war games into adulthood and it became a central aspect of his art. He built ponds to sail his toy boats and, though far from the ocean, put a sign next to an ash tree "Mare nostrum," as the sound of the wind in the leaves reminded him of the sea. Gradually he took his place among classic British gardeners like Shenstone, and the successive designers of Stowe and Caversham. Not content to cultivate his garden, Finlay embarked on the first of his many art-world wars. This was with his publisher Stuart Montgomery of Fulcrum Press. When Fulcrum printed The Dancers Inherit the Party in 1969 they incorrectly described it as the first edition. A five-year long legal battle ensued, which was costly in financial terms to all parties but also caused many fractured friendships & the bankruptcy of the small press. I've seen many an author get hysterical over typographical errors, missed deadlines and other minor matters, but this is absurd! Fortunately Finlay found a longstanding, tolerant and loyal collaborator in Michael Harvey who began calligraphing and carving inscriptions for him in the 1970s. Finlay had over 80 collaborators -- though not in the French sense -- as a list on Wikipedia shows. This tells us one thing: he was impossible to work with! He had the idea, then the calligrapher, typographer, stone carver, or silk-screener executed it. He liked working with commercial artist more than fine artists, the latter were too snooty and full of their own ideas, whereas commercial artists were good at following instructions. In the '80s Finlay's interest in German architect Albert Speer deepened and he began to incorporate the double lightning bolt insignia of the SS into his works. Less than a generation after the War he came up with such whimsical ideas as "The Third Reich Revisited." Incredibly, one of his concrete poems is reimagined "enacted by the Reich Labour Corps, on the Terracing at the Zeppelin Field" (the famous Nazi rallying ground in Nuremberg). Shades of "Springtime for Hitler"! A friend of mine who is also a keen "art-gardener" went to visit Stonypath and Finlay told her the story of the tax collector. There was a ruined byre on the property and after much thought Finlay decided it would make a great temple to Mercury. There is a Greek myth about Zeus and Hermes (Mercury) coming to the house of a poor, old couple (Baucis and Philemon), being well fed and housed, and on their departure, turning the straw roof of their house into gold & the wooden pillars into marble. So Finlay painted one roof tile gold to indicate the beginning of the transformation and left the rest of the ruin to indicate the poor dwelling. After listening to Finlay's explanation, the tax assessor said, well, I will come back when you've finished it. Vengeance is an act of good faith. Schemes for making a great deal of money usually cost a lot. 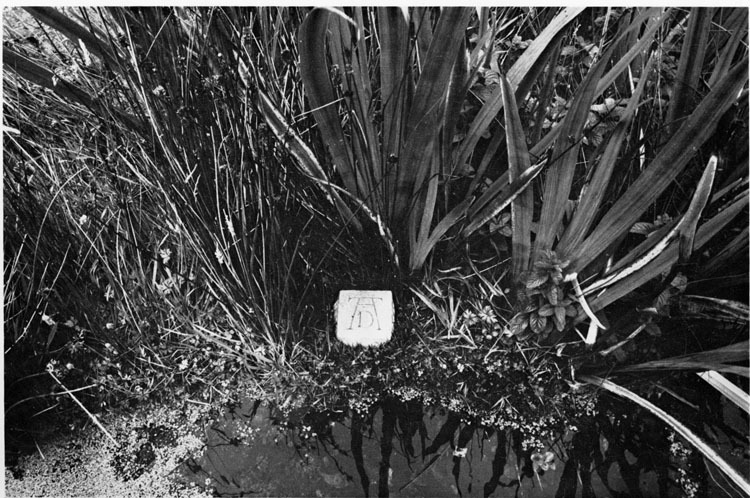 Carved on a low, broken column in a clearing the numerals 010 30 265 (the International Dialling Code for Delphoi). A similar column, but with the dialling code for Rome (OIO XXXIX VI). A boulder inscribed in one corner with the word moss. Austere neo-Classicism is a hallmark of Finlay's garden art. As Jonathan Jones pointed out in an article in the Guardian, a stone at Stonypath is carved with the provocative statement, "The world has been empty since the Romans," attributed to the French revolutionary Louis-Antoine-Léon Saint-Just. Saint-Just is an important touchstone for Finlay as the French revolutionaries looked back to the Roman Republic as an ideal state. At the end of his career, Finlay's fickle feuding reached the international stage. In 1987 disaster, rather than terror, struck when the French government, perhaps in recognition of the "Auld Alliance" between the Jacobites and the French court, commissioned him to create an artwork for the bicentennial of the Declaration of the Rights of Man. His interest in revolutionary politics made him an ideal candidate, but the French know "collaborateurs" when they see one! Finlay's lifelong obsession with war (particularly German military might of the Second World War, expressed in U-boats and Panzer divisions) and the struggle with Fascism hoist him on his own petals. It came out that he was not only fascinated by Nazi imagery but had corresponded with Albert Speer! The French people were incensed; the British press defended him. But like a true Jacobin, thinking murder was the way to carry forward the revolution, Finlay went on the attack. Yes the Nazis were abominable but they built great edifices, was his response. Another of his garden temples is dedicated to Apollo, "his music, his missiles, and his muses." Since Apollo was the God of War we shouldn't be surprised. But when his taxman refused to give him exemption on the ground it was not a religious building he had another campaign to fight. At Documenta 8 in Kassel, Germany, Finlay installed four full-size guillotines, called "A View to the Temple," with quotes from Poussin, Diderot, Robespierre & himself on them. Big art always garners big attention. Finlay was finally an artworld commodity and traded in his wellies for Dolce & Gabbana. His temples are mock-historic edifices, but who are we to say that they are not sacred sites? As Michael Charlesworth wrote in his essay "Contemplative and Spiritual Use of the Temple at Little Sparta" (1994), "Sacred and scared are just a typing error apart and so are worship and warship." Apollo was not the god of war; the god of war was Ares or Mars.